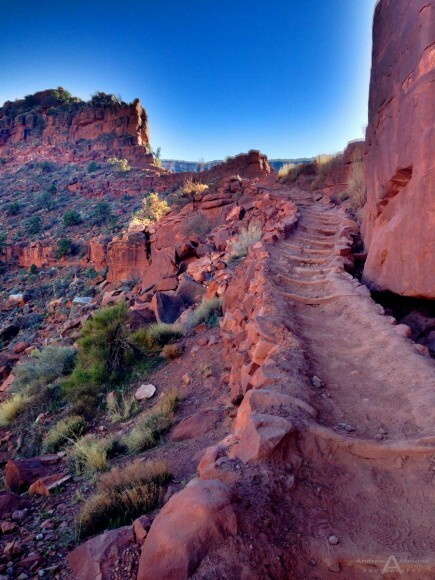 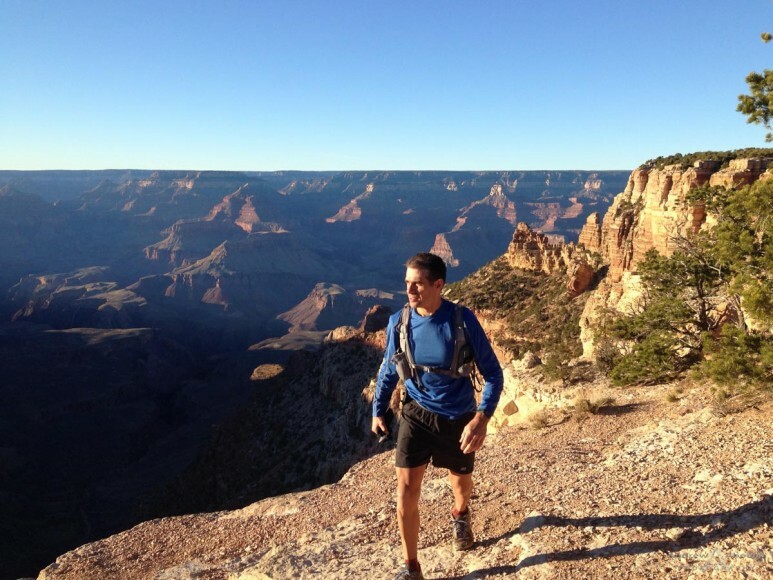 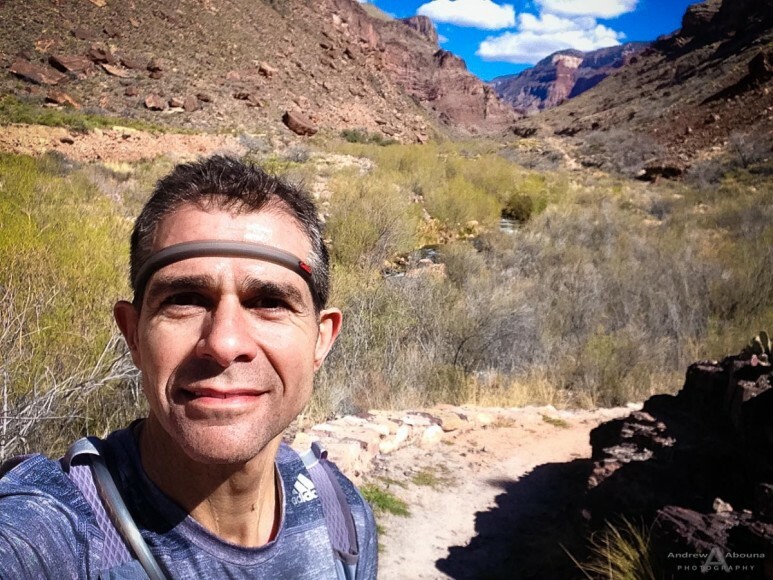 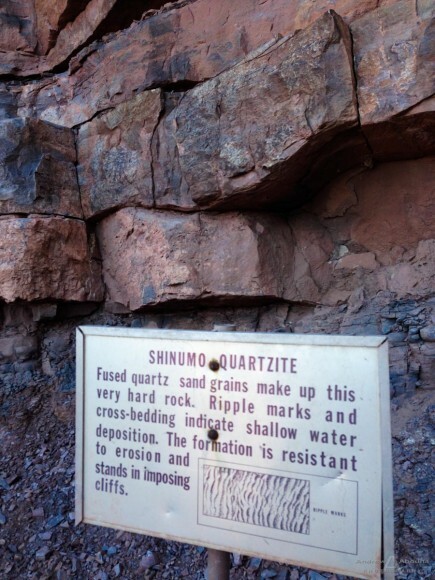 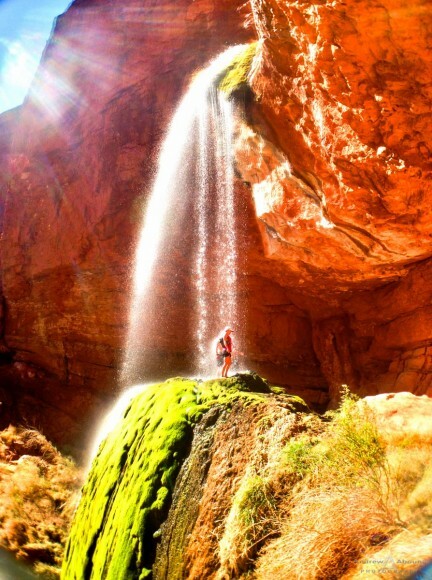 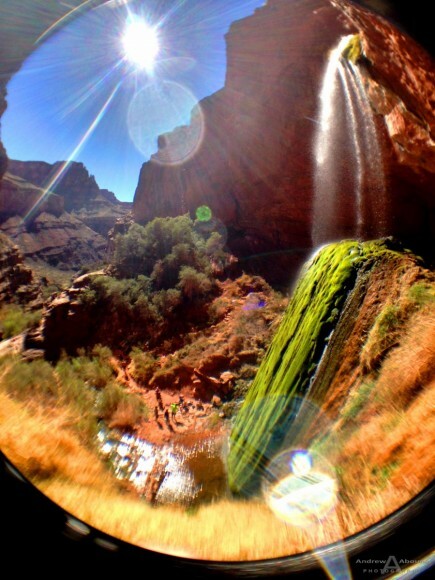 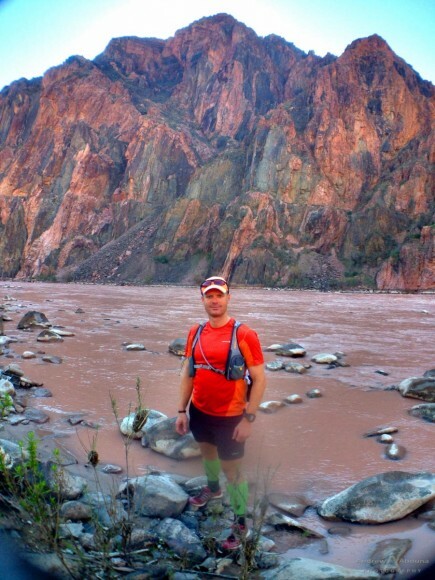 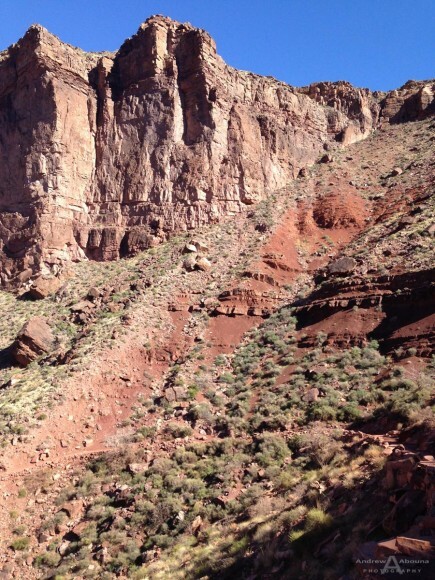 Ultrarunning the Grand Canyon – An adventure through nearly 2 billion years of the Earth’s geologic history. 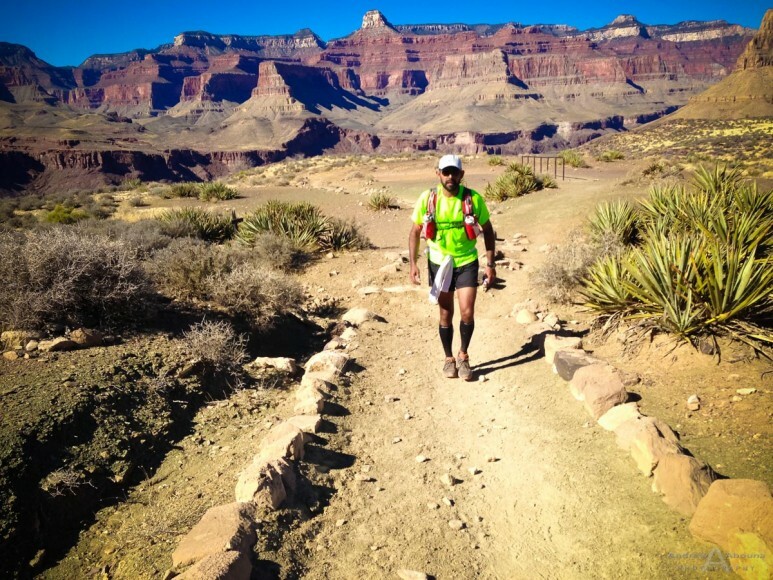 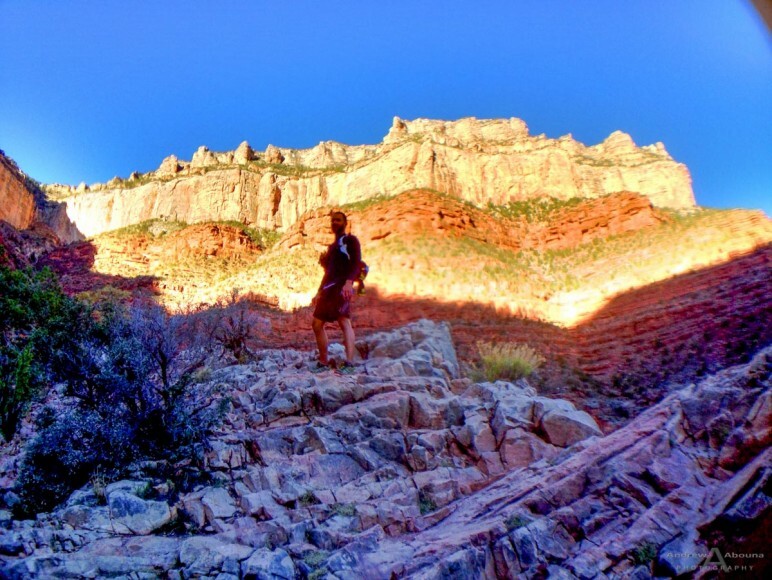 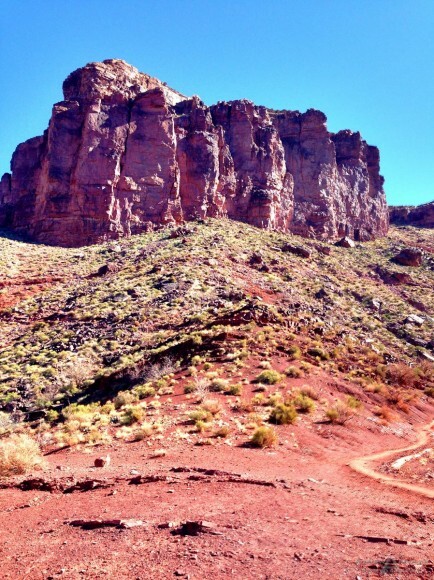 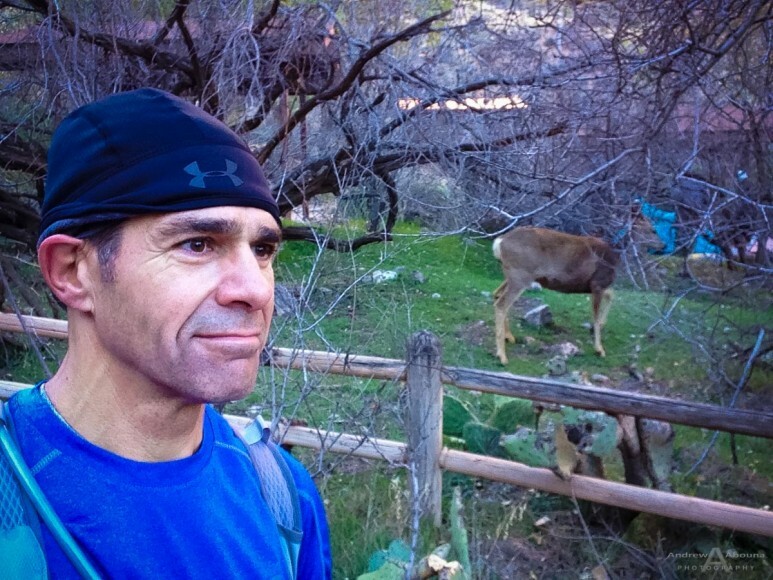 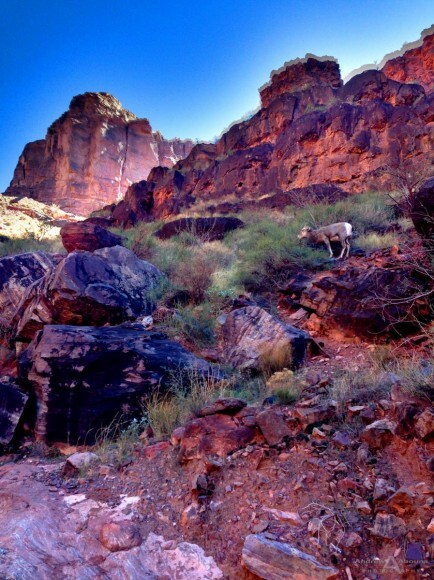 Running down, through and back up the Grand Canyon, or rim-to-rim, and the longer rim-to-rim-to-rim, are ultrarunning adventures that are probably on the list of many trail runners. 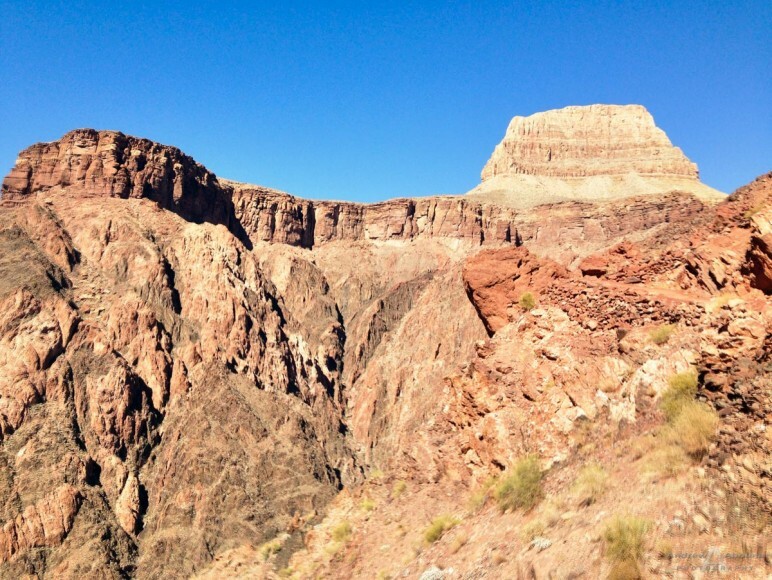 We recently did a modified version of the rim-to-rim that covered about 30 miles of Grand Canyon terrain. 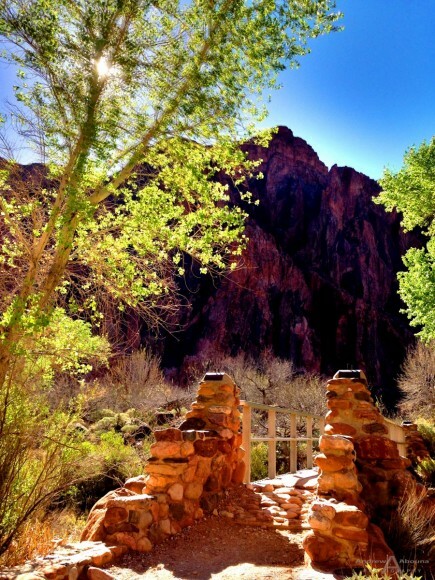 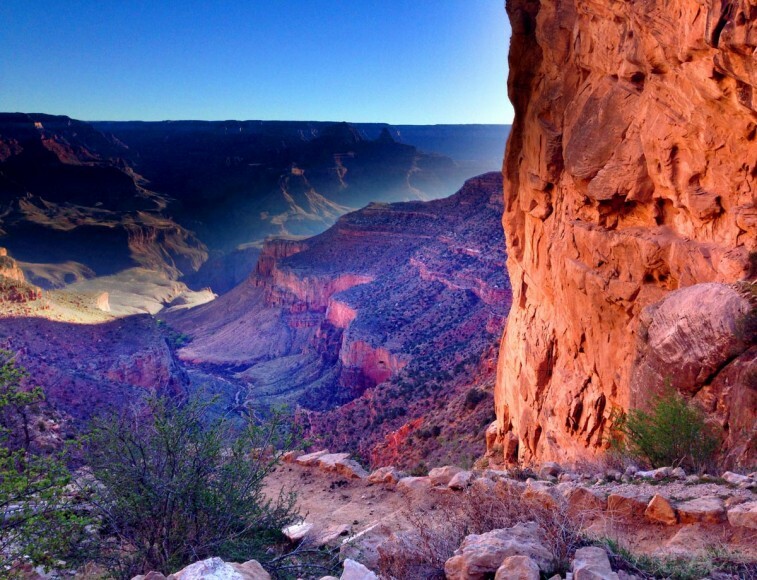 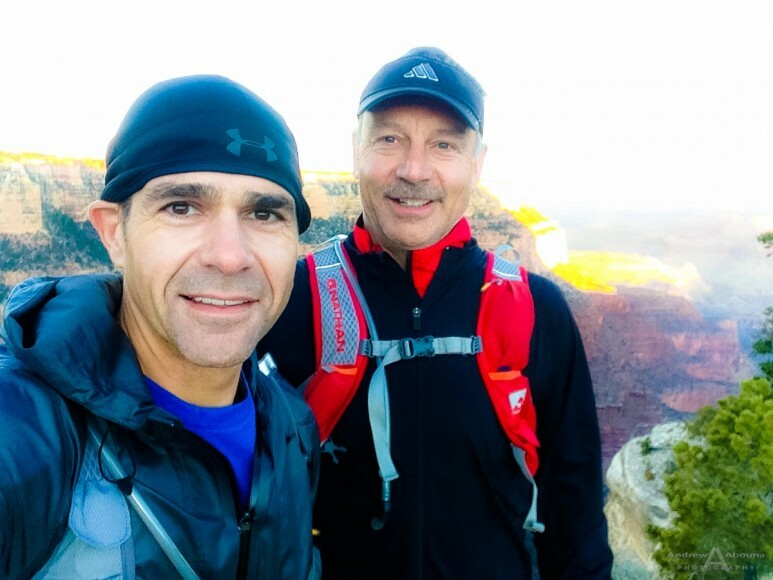 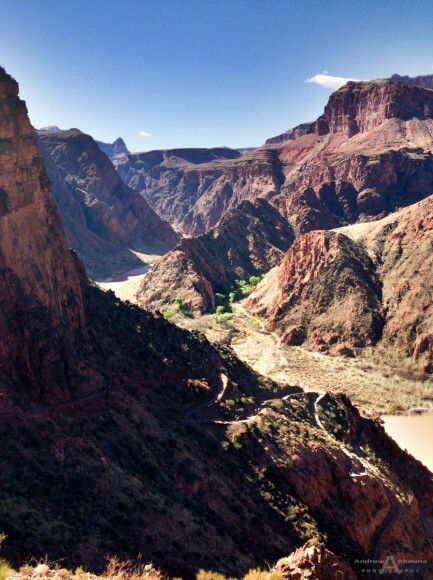 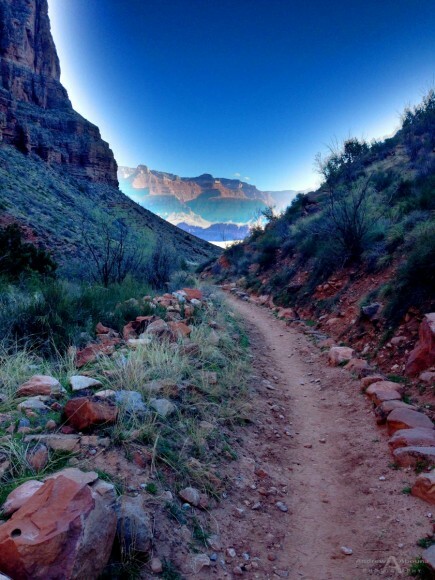 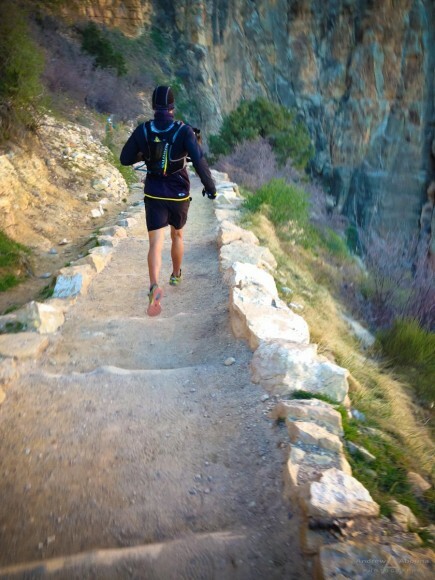 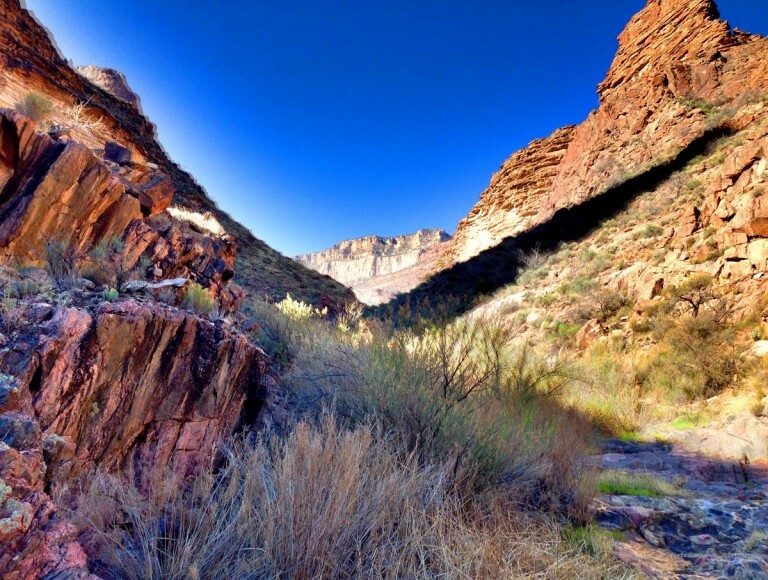 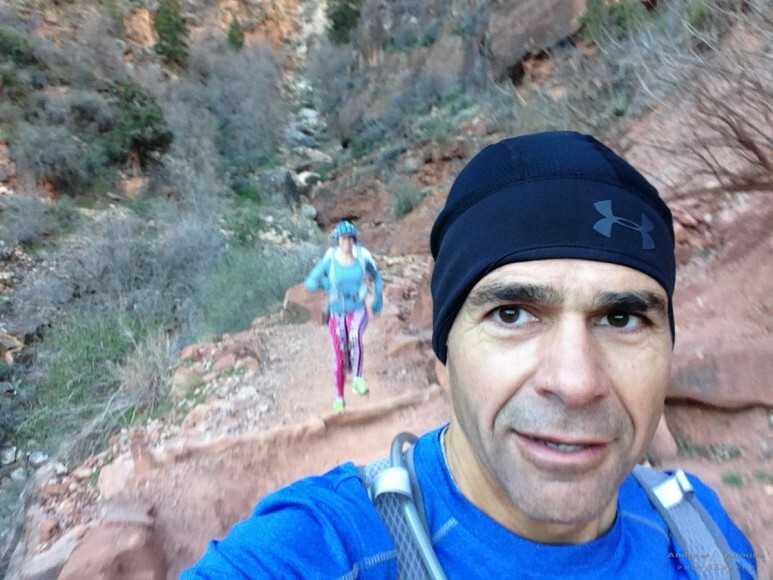 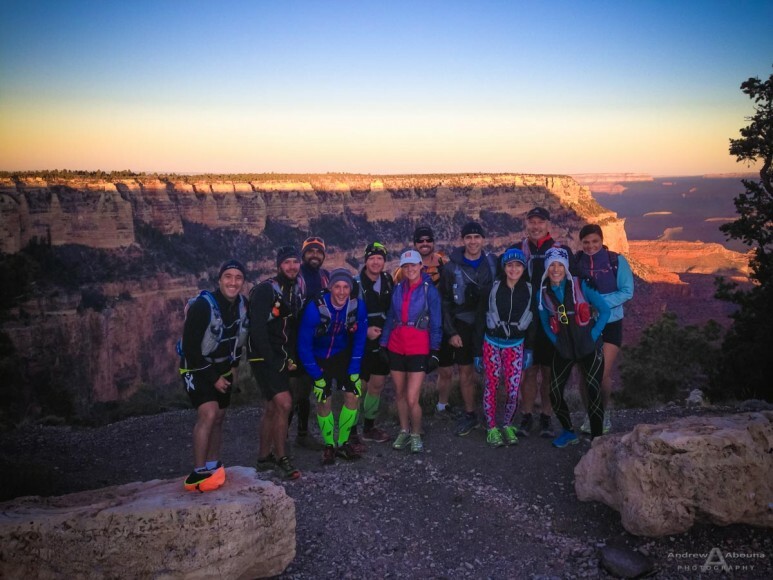 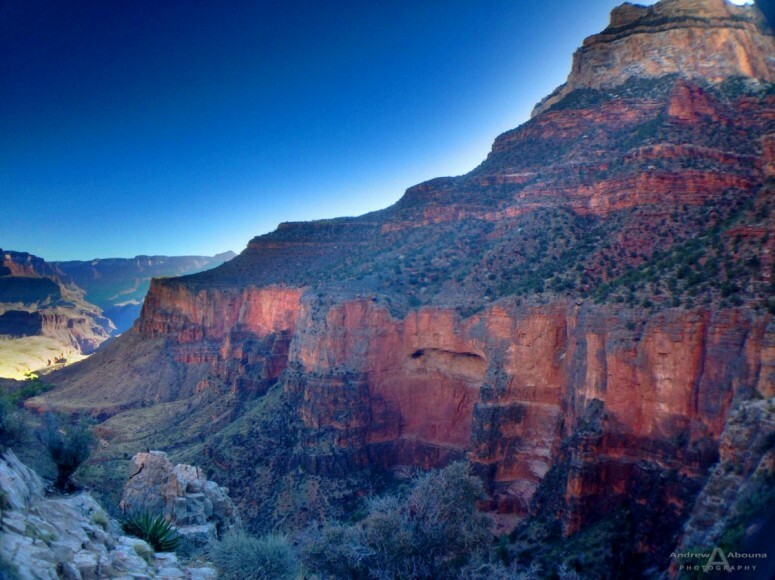 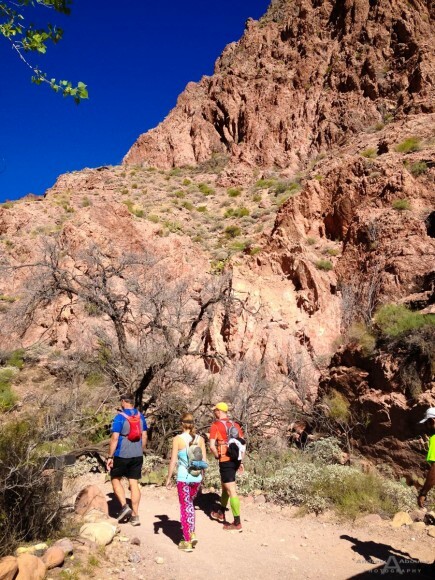 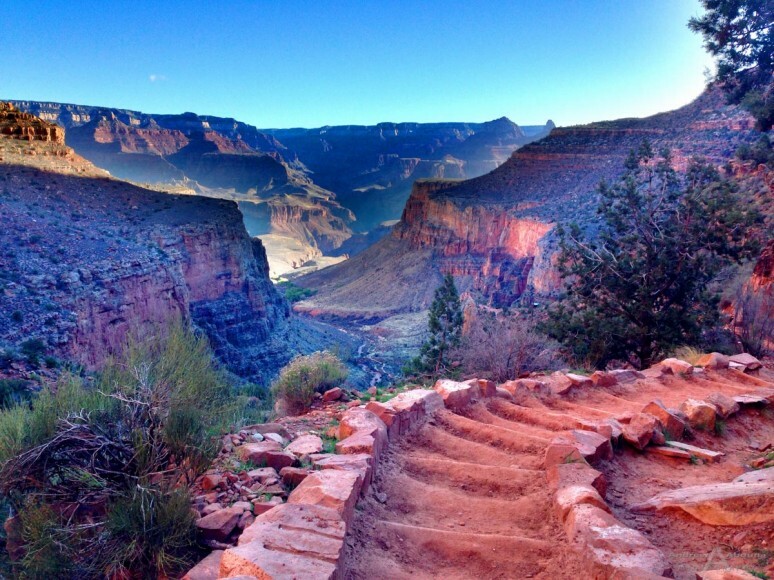 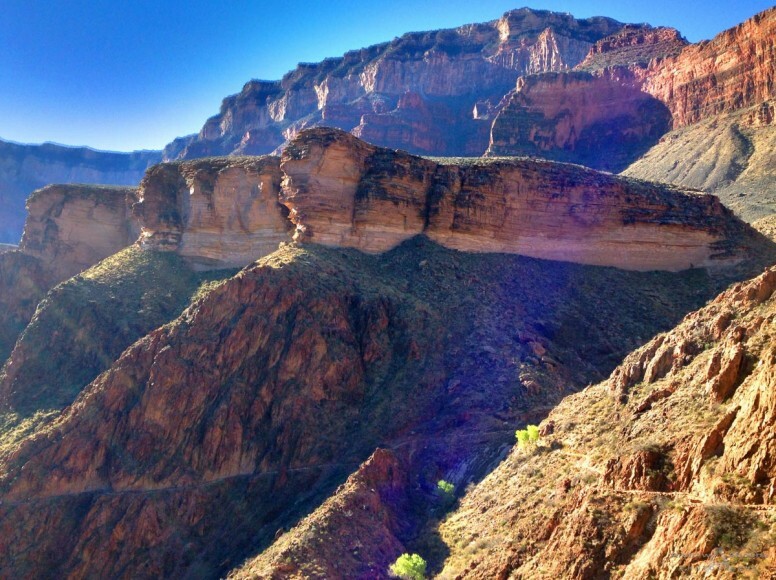 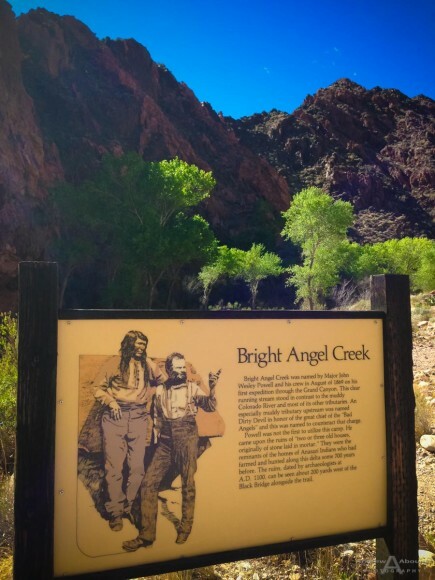 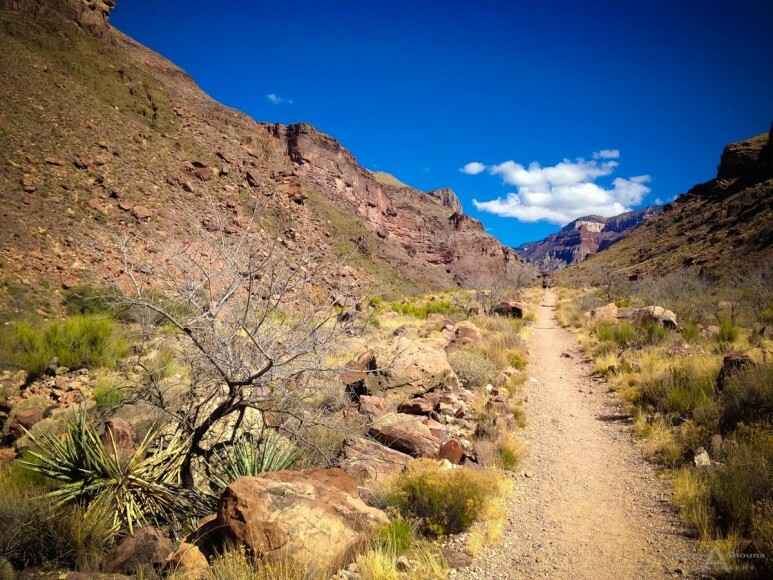 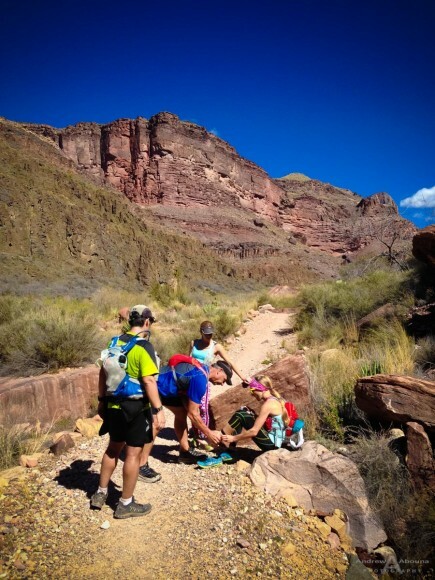 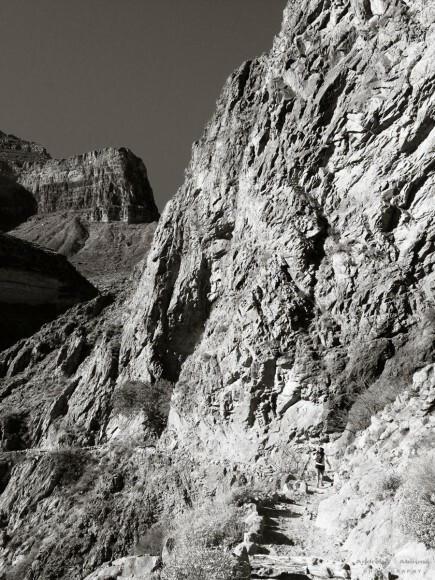 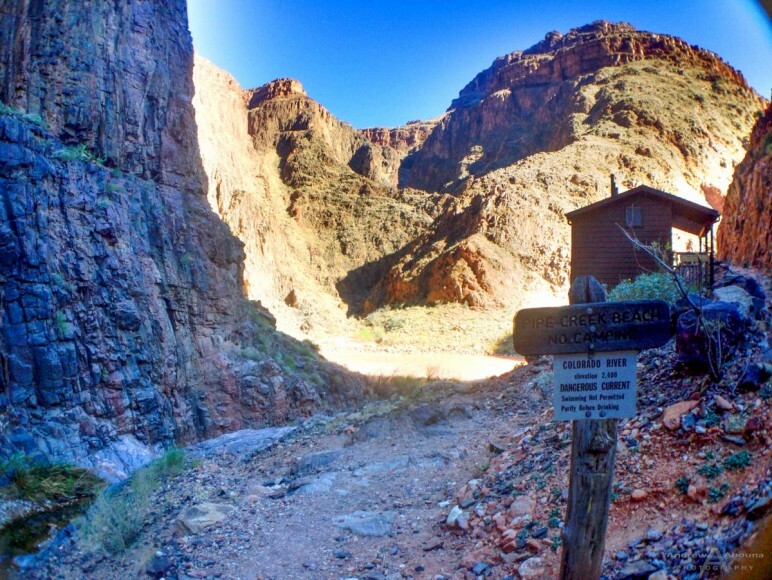 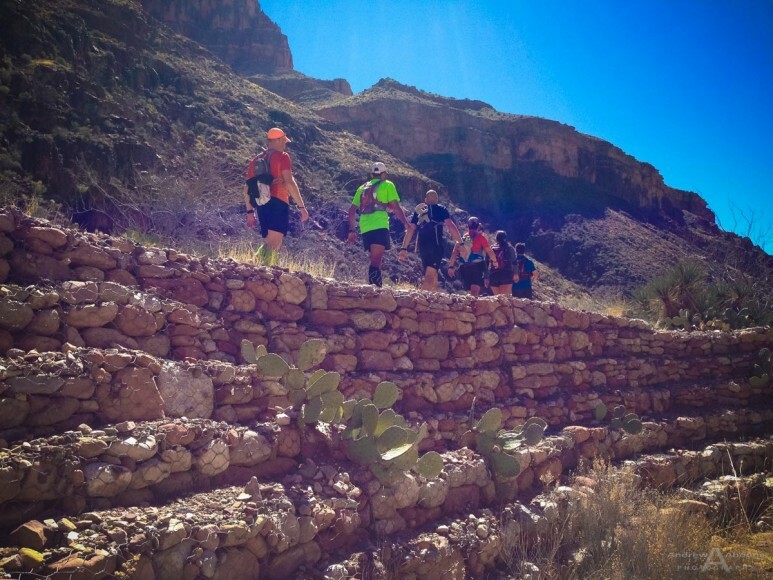 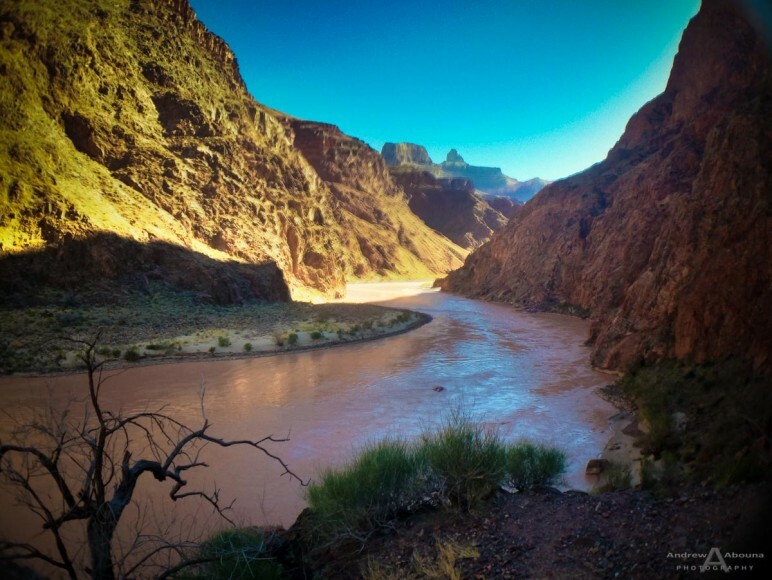 The ultrarun began at the Bright Angel Trail at the Grand Canyon’s South Rim, at an elevation of about 6,800 feet, on down to the Colorado River where the elevation was about 2300 feet. 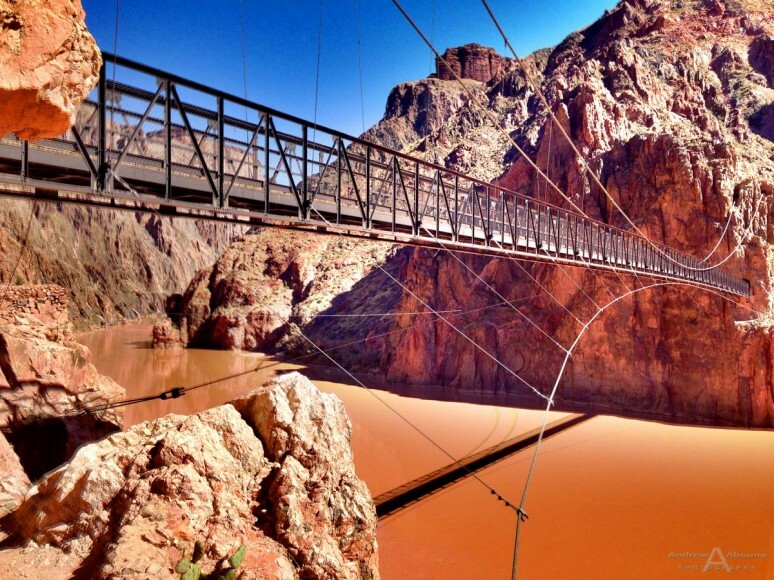 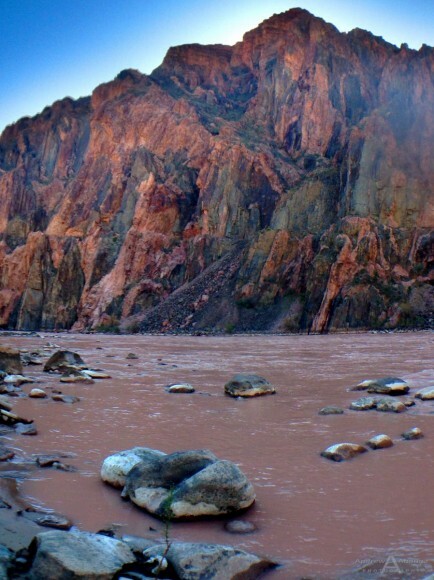 As it continues it’s erosion of the Grand Canyon, the Colorado River is so brown with silt as that it looks like chocolate milk. 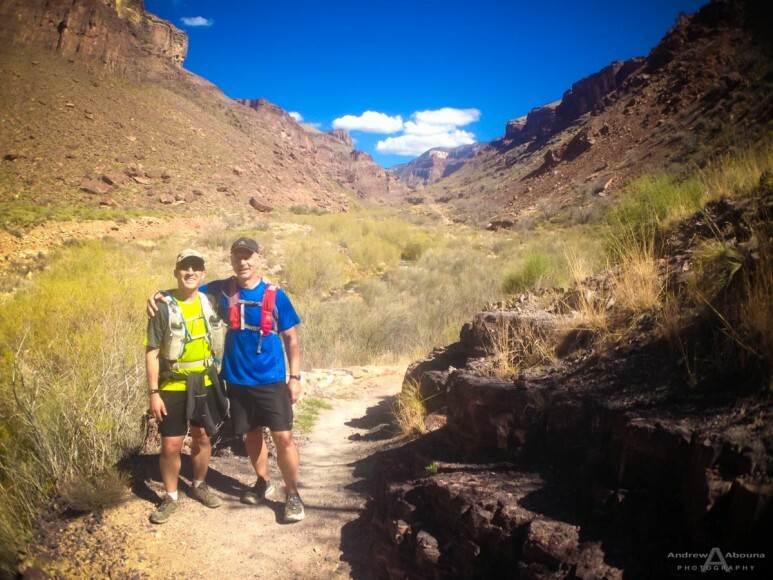 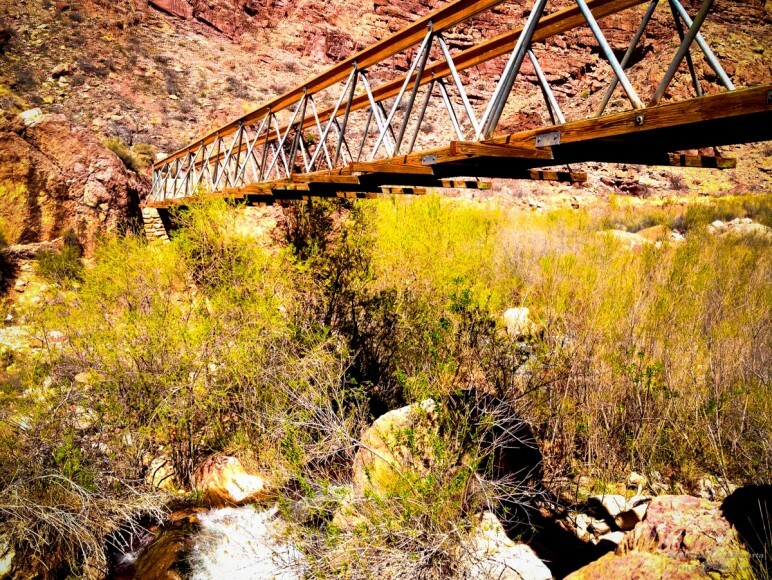 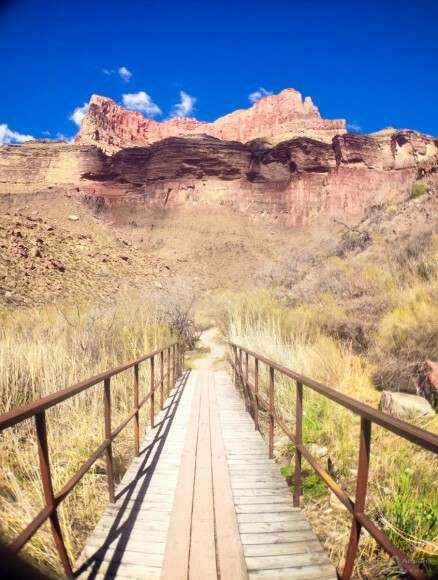 We crossed the bridge over the Colorado River, regrouped, then ran up past Phantom Ranch on our Grand Canyon rim to rim run to Ribbon Falls at about 3600 feet elevation. 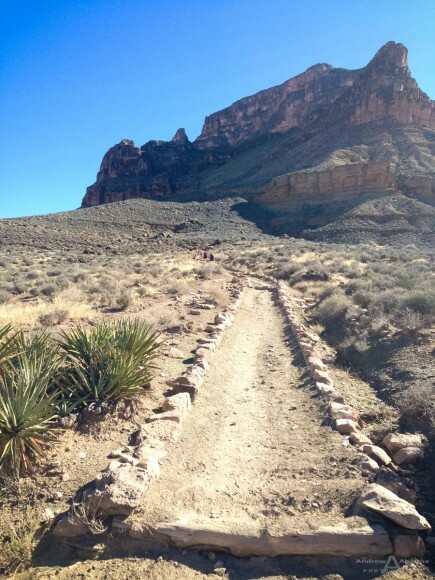 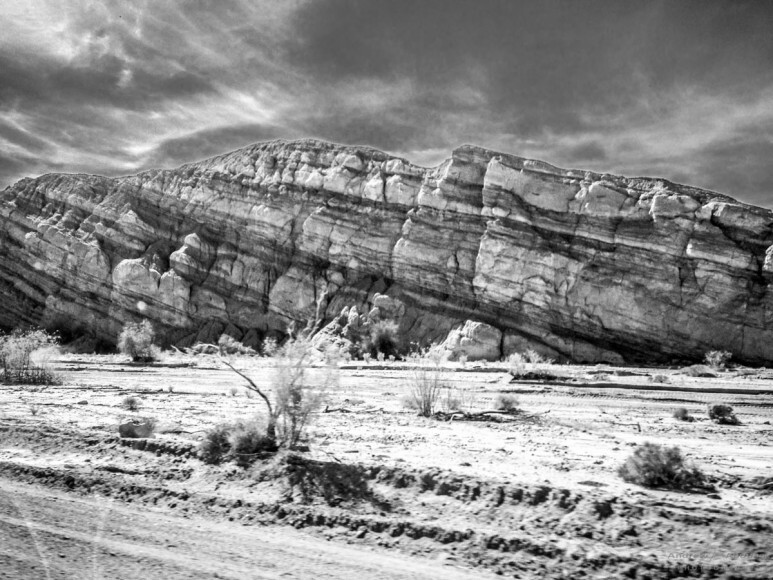 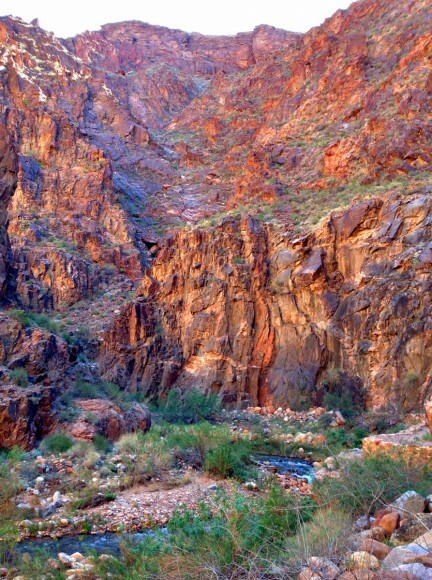 The terrain varied greatly along this route, both in terms of the rock formations, vegetation, trail surface, and elevation. 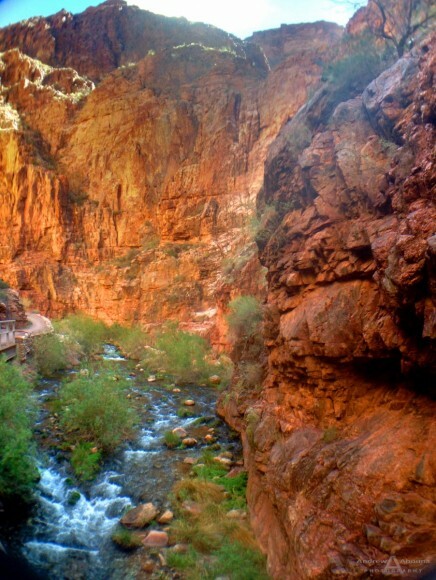 Ribbon Falls is not too far from the base of the North Rim. 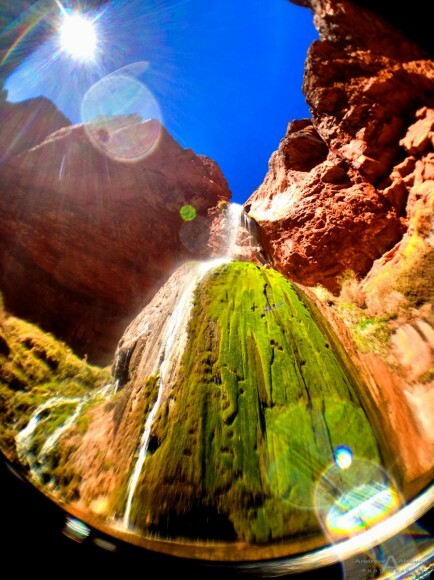 Ribbon Falls was a tremendous sight. 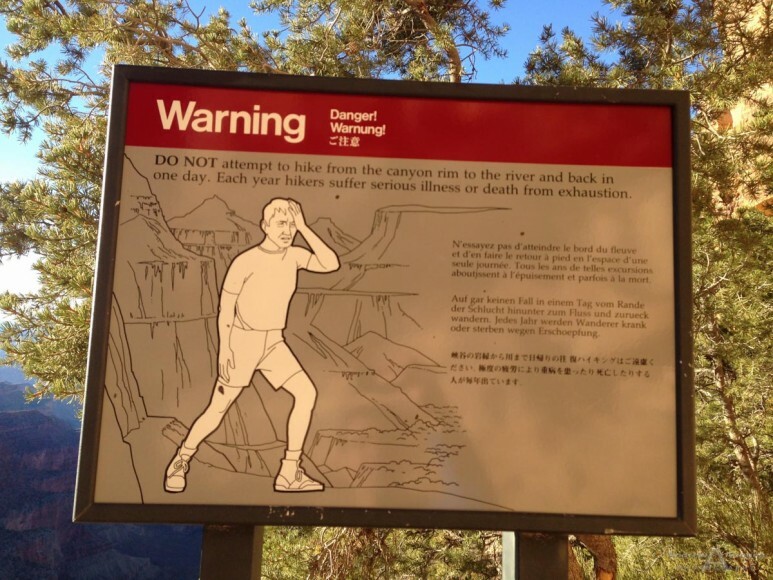 The height of falls was perhaps 80 feet or so, and the water cascaded down to create two pools, one at about 40 feet and the other pool at the base. 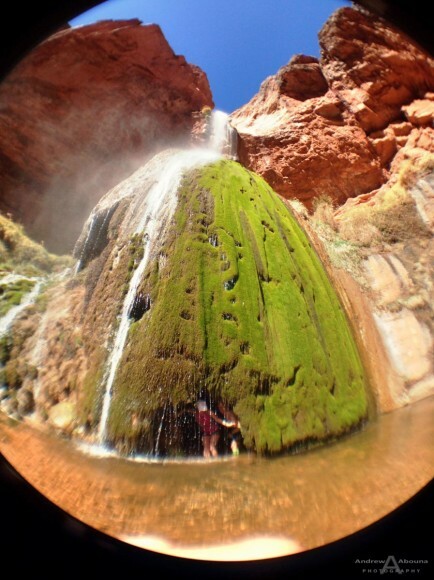 Between the two pools the rock face was covered in a lush green moss with an overhang that was possible to enter. 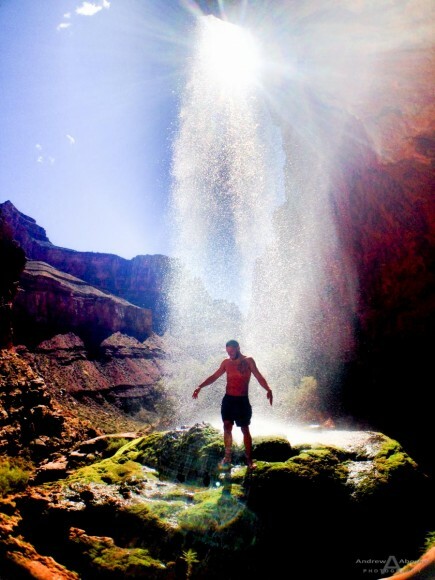 The water was quite cold, but a true oasis of clear, sparkling water and misty waterfall spray. 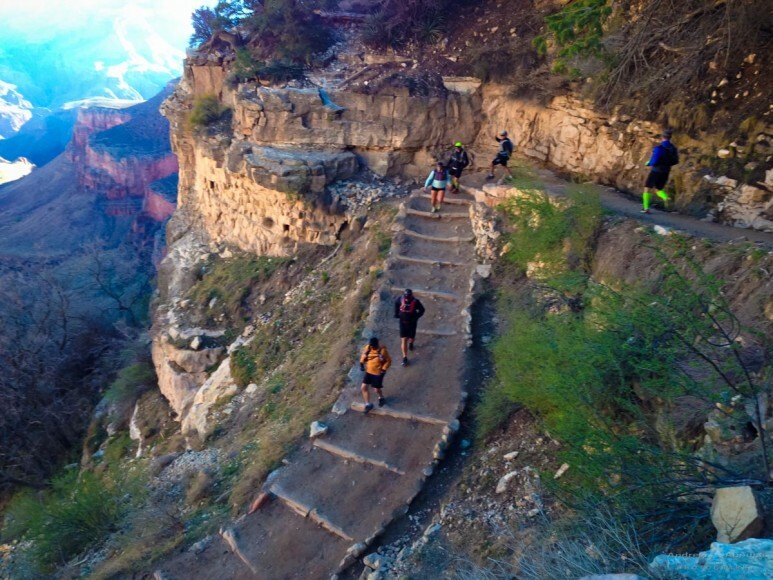 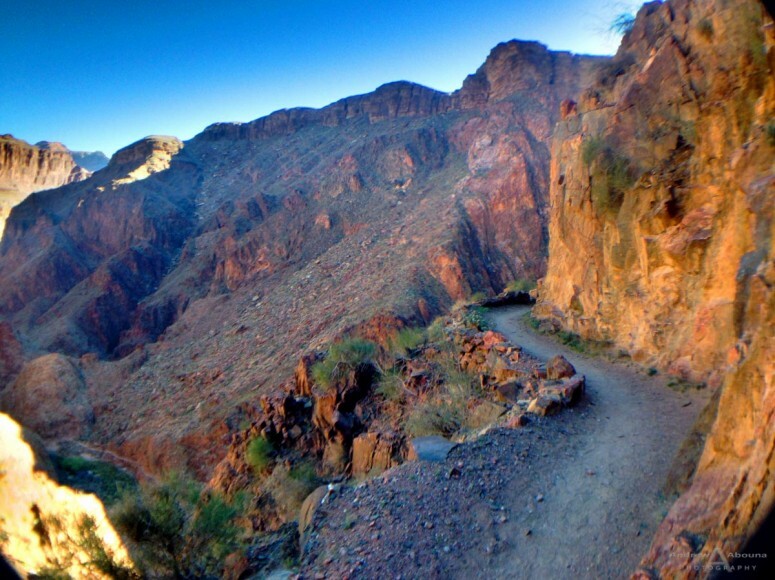 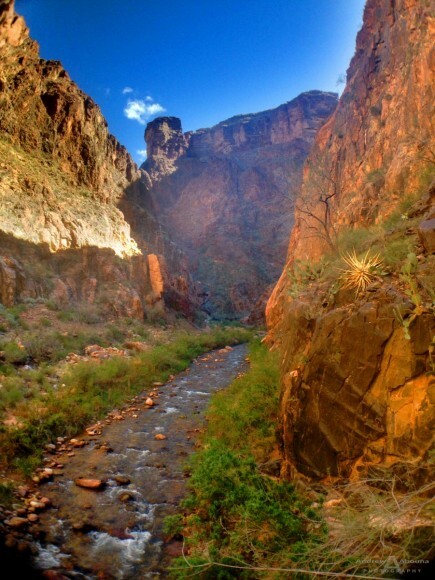 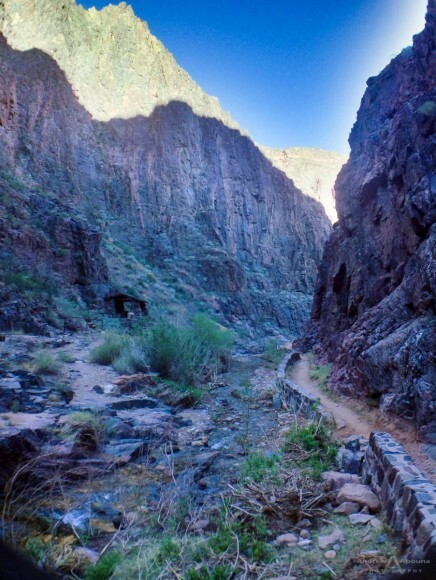 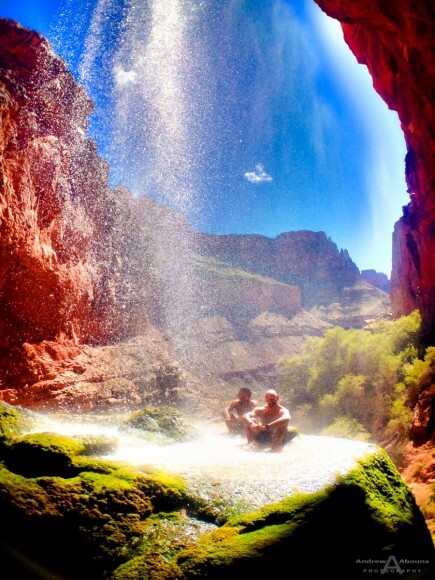 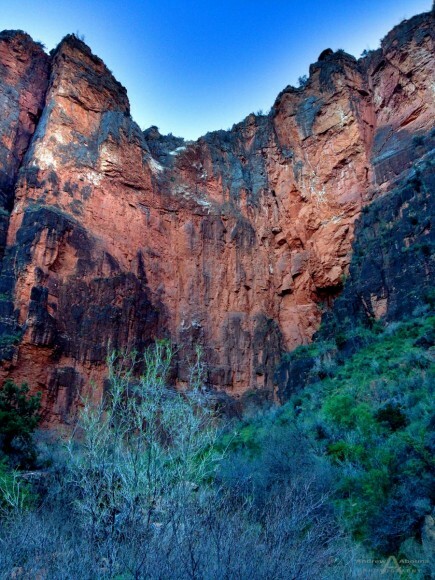 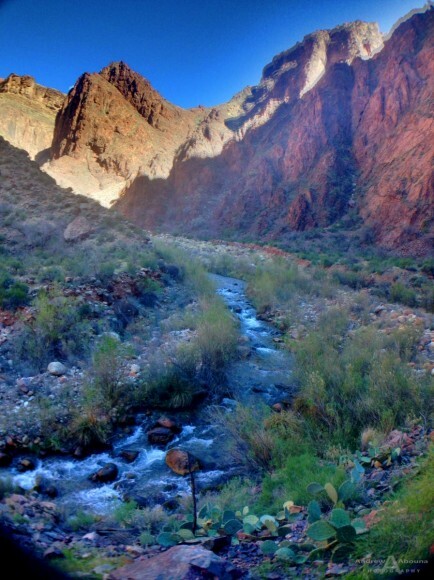 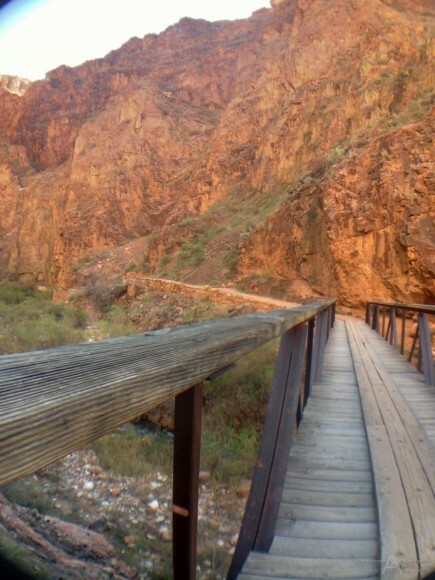 It’s about 18 miles from the head of the Bright Angel Trail head atop the South Rim to Ribbon Falls. 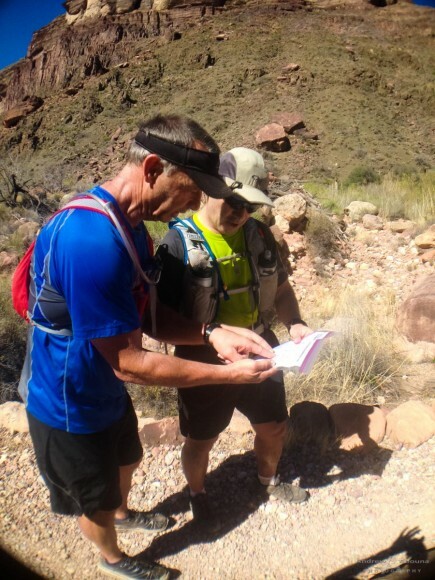 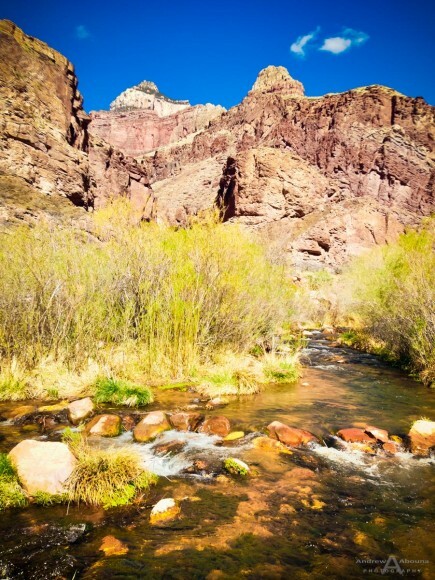 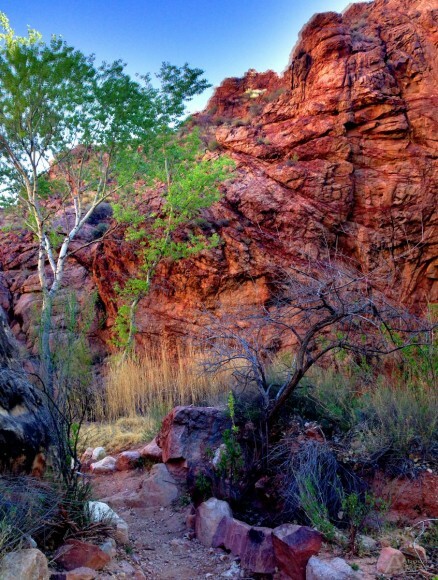 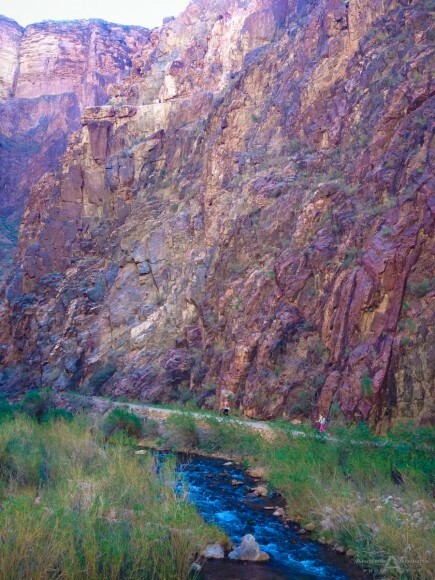 After a half hour stop we began our return, across the tributary stream and back to Phantom Ranch for refreshments. 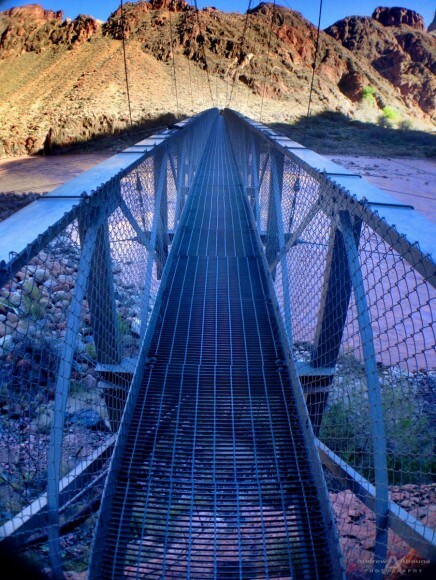 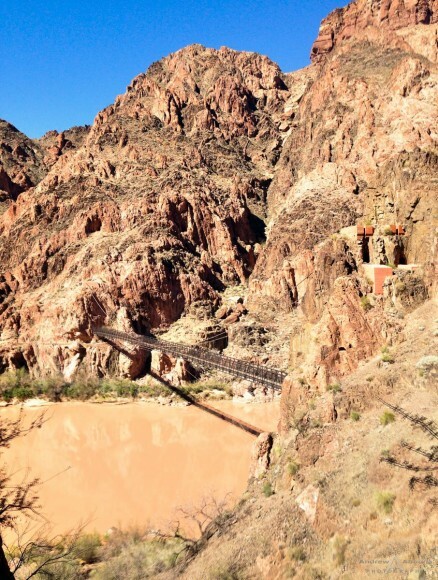 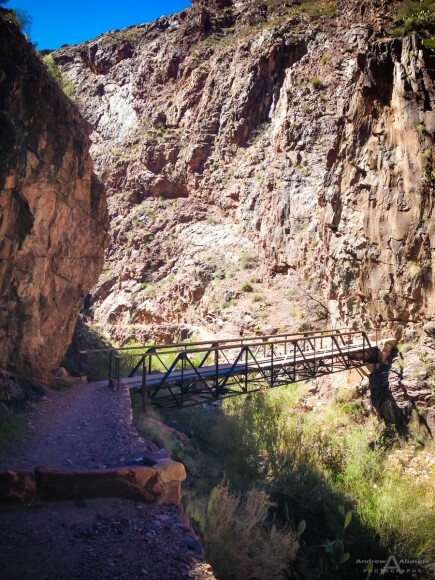 Next, we continued running towards the Kaibab Trail, crossing the Colorado River again, but this time on a different bridge than the one we had crossed earlier. 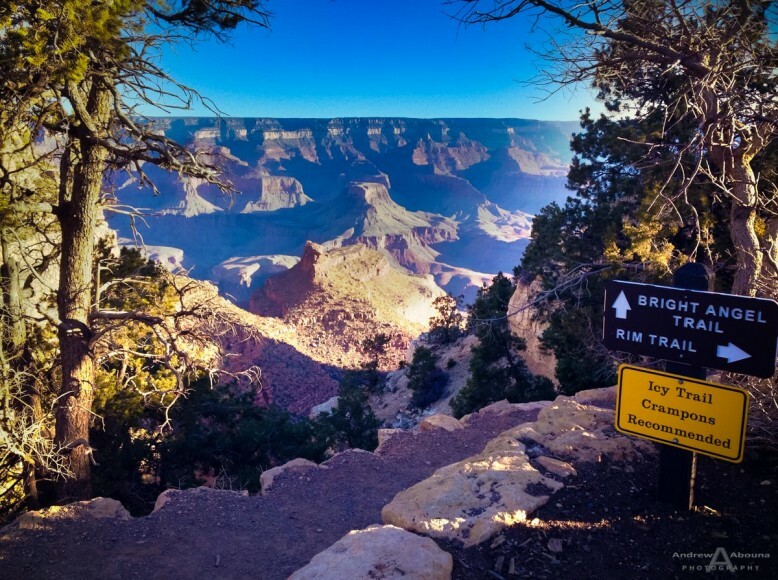 The Kaibab Trail up the South Rim of the Grand Canyon is quite different than the Bright Angel Trail that we descended on. 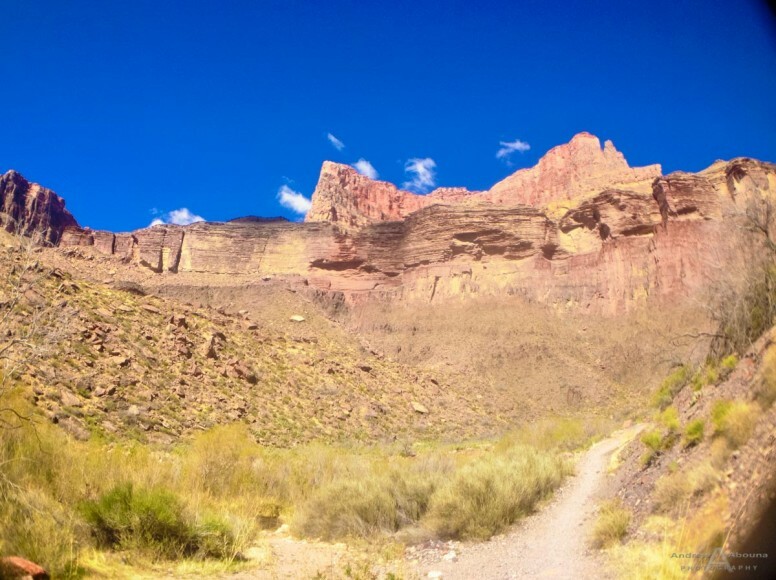 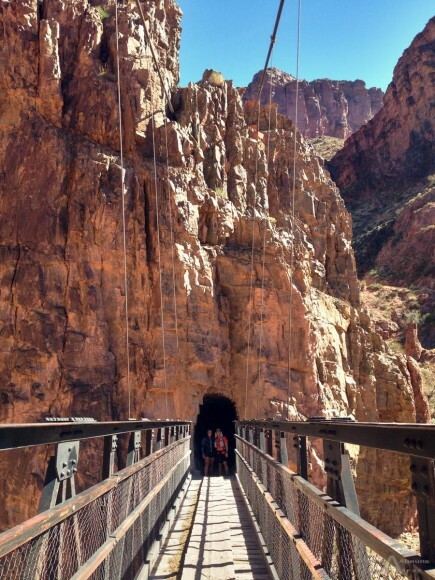 There climb is a steeper for one, and it’s also used by the mule trains that bring people and supplies into and out of the canyon. 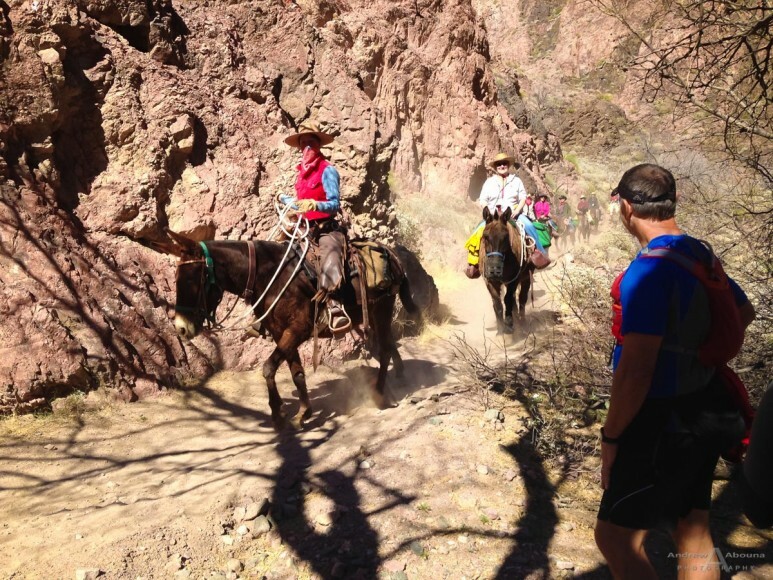 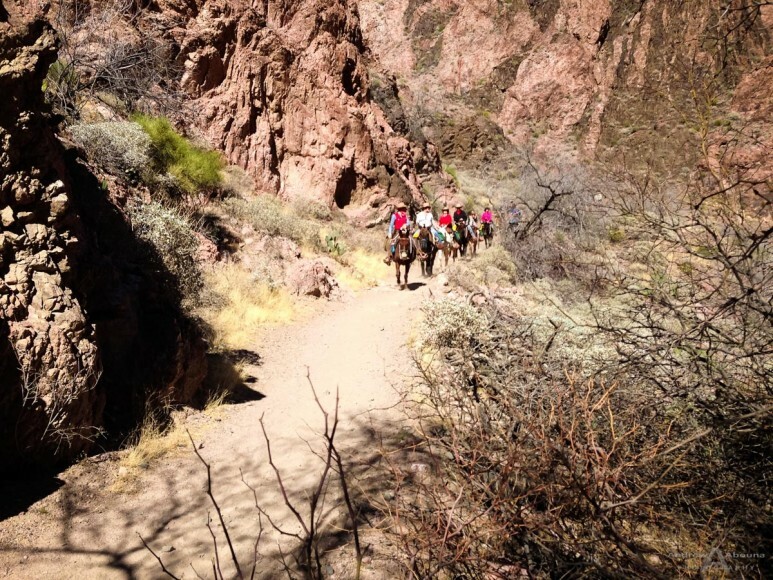 Though we didn’t encounter any mule traffic on the ascent, we did see them earlier near Phantom Ranch. 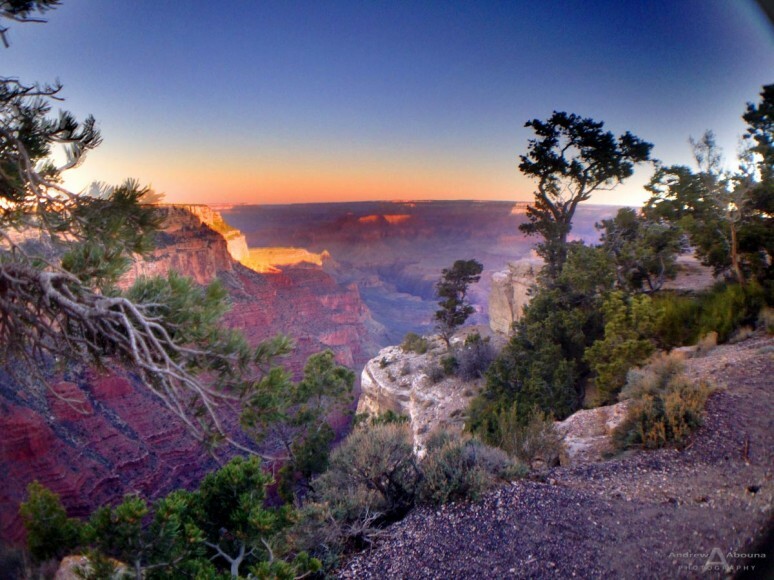 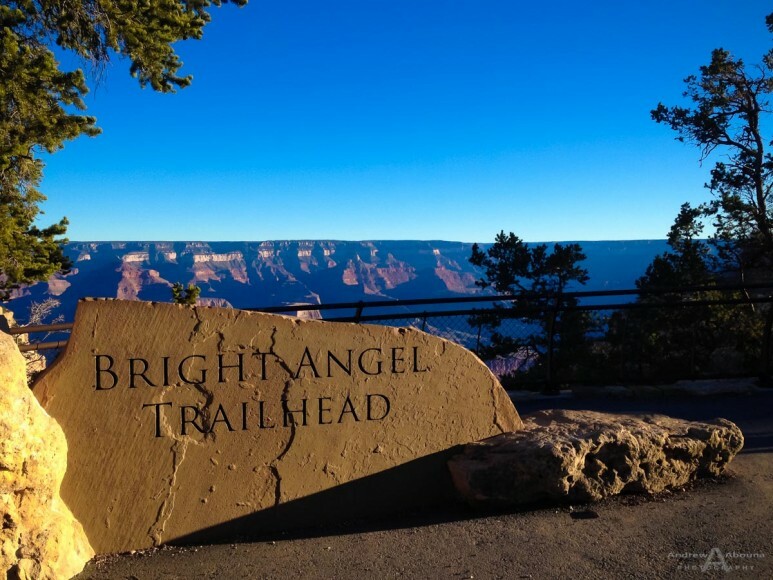 The views up Kaibab Trail are also different than those down the Bright Angel Trail; in fact, no matter which trail or where you are in the canyon, all of the views are different and incredible. 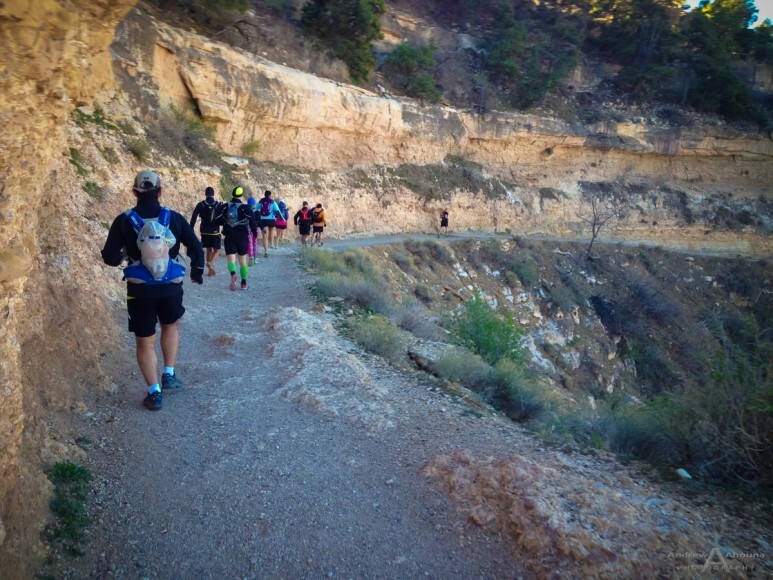 The ascent up the Kaibab Trail was challenging but wonderful nonetheless. 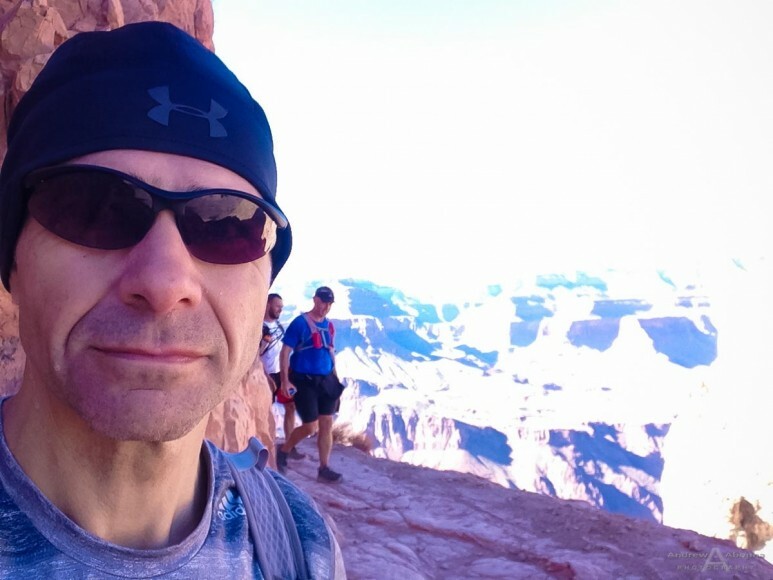 By the time we reached the top we had covered about 30 miles and made a total descent of about 13,000 feet and about the same amount ascent, too. 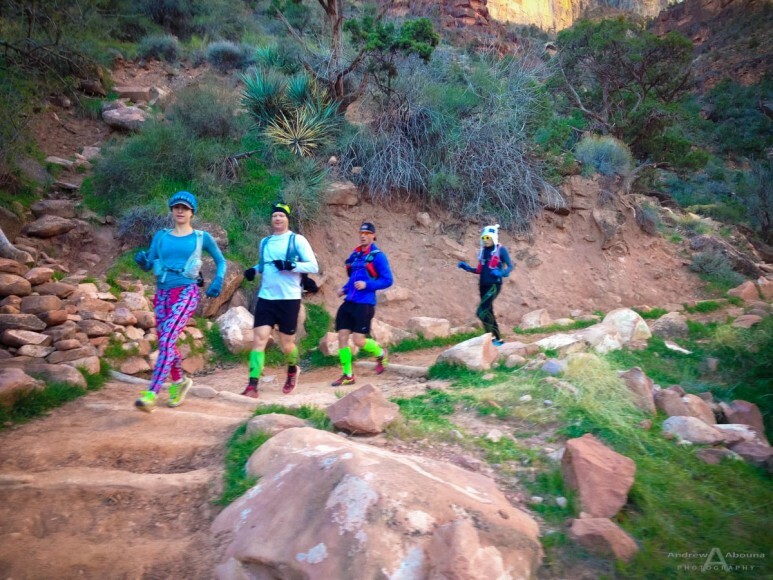 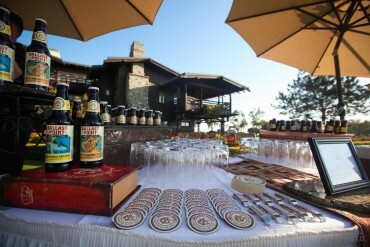 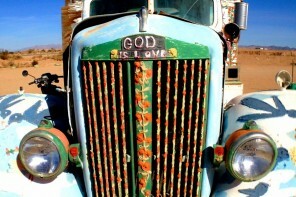 The Grand Canyon rim to rim run was an amazing adventure, and one which we look forward to repeating. 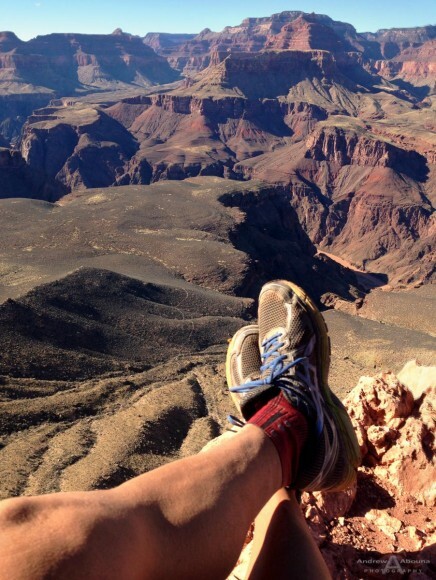 Until then, it’s on to other adventures in running, cycling and exploring. 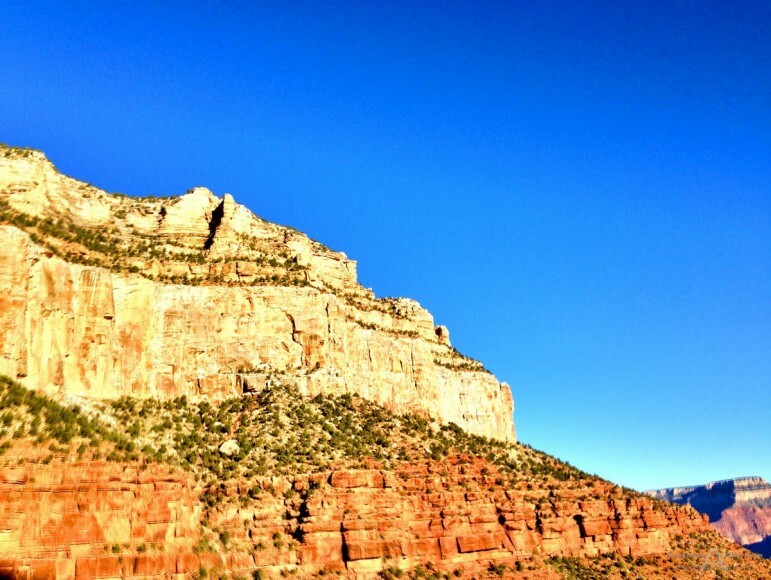 All photos taken with my iPhone.